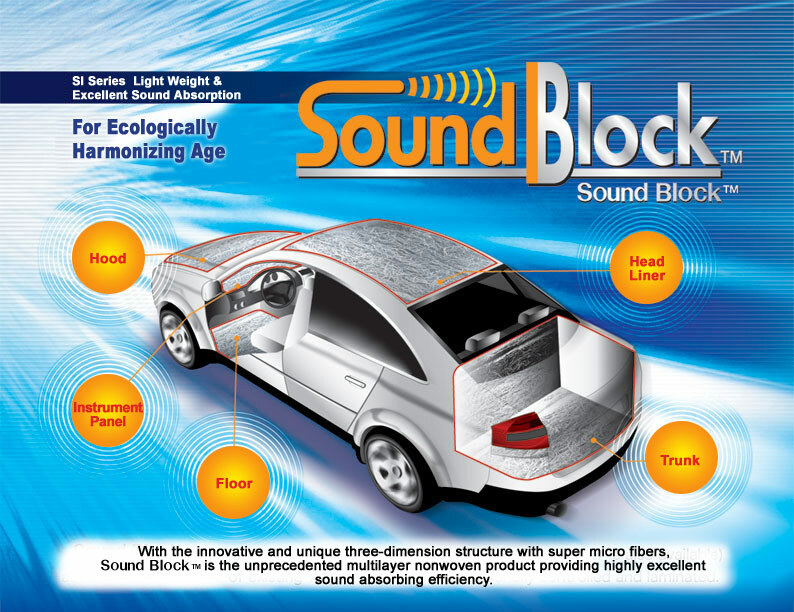 Sound Block™ demonstrates highly excellent absorption efficiency in the frequency rage of 1,000 to 5,000Hz such as noise from vehicles. Sound Block™ has excellent thermal insulation property although it is light. Sound Block™ improves the air conditioning efficiency of vehicles. Sound Block™ achieves reduction both in weight and in thickness of the material without damaging the excellent sound absorbing property. Sound Block™ facilitates die-cut process in piles much easier. Sound Block™ allows applying adhesives on the surface. In response to the social demand of recycle, Sound Block™ composed of same materials is available. Sound Block™ passes the flame retardant standard FMVSS No.302.